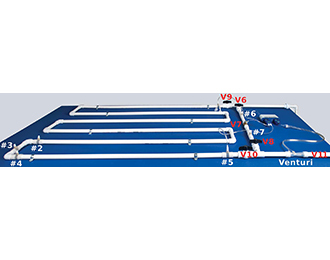 Estimate the energy loss of water flowing at various flow rates through PVC pipe. Estimate the energy loss of water flowing through an elbow. Estimate the energy loss of water flowing through a valve. In this experiment students determine the major losses due ot friction in pipes and the minor losses due to elbows and valves. The loss over a long distance is measured between pressure taps #1 and #5 (shown in the picture above). The water velocity is measured using the Venturi tube attached to the General Flow Sensor. The water velocity is varied to explore the dependence of the losses on velocity. The minor losses due to elbows are found by comparing the pressure at tap #3 and tap #4.